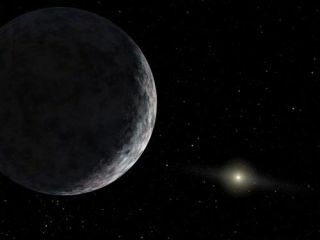 Strangeweather on the icy dwarf planet Eris could be causing changes that scientistsare now seeing at the methane-ice surface of this distant object in our solarsystem. Eris is thelargest known solar-system object beyond the orbit of Neptune. It is larger thanPluto, with a diameter of ranging somewhere between about 1,490 miles and1,860 miles (2,400 km and 3,000 km). A team of researchersexamined data on Eriscollected from the MMT Observatory in Arizona. They specifically looked atconcentrations of methane ice based on light-reflection and absorptioninformation.? Theirresults show possibly nitrogen ice mixed in with the methane ice covering Eris' surface. And the relative amount of nitrogen ice increases with depth into theice, they found. Currently,Eris is at its farthest distance to the sun, called aphelion, along its about560-year orbit, meaning the planet is nearly 100 astronomical units (AU) fromthe sun, or about 9 billion miles (14 billion km). Along its orbit, Eris sweeps asclose as 38 AU to the sun when at perihelion. Due toEris' tilt, a different hemisphere faces the sun when at perihelion andaphelion. On thesunlit hemisphere or pole at perihelion, lots ofsublimation would have occurred to turn nitrogen into gas. (Sublimation isthe process of ice turning to gas while skipping the liquid phase.) This gas wouldbuild up in the atmosphere ? likely a very thin one around such a small object? to increase the pressure and drive winds toward the shaded pole. Nitrogenice turns into a gas at cooler temperatures and so there would be more nitrogengas in the atmosphere compared with methane. Then, at the shaded pole, alsocalled the winter hemisphere, the gases would condense into snow-like ordew-like material that would fall onto Eris' surface as nitrogen ice. As Erismoved closer and closer to the sun, this same process would occur for methane,with methane sublimating on the sunlit hemisphere and falling as methane ice onthe shaded pole. As the windscontinued to blow from the sunlit side to the shaded hemisphere (as summerprogressed on the sunlit side), nitrogen would be depleted. And so relatively moremethane would whoosh over to the shaded side and fall as methane ice. The polethe researchers observed had been shaded for years while Eris was atperihelion. That same pole is now facing the sun and has been for decades tocenturies, the researchers say. "Thehemisphere in darkness then, is the hemisphere we are seeing now at apheliontoday," researcher Stephen Tegler, an astrophysicist at Northern Arizona University, told SPACE.com. "In other words, we may be observingtoday a signature of the winds that condensed out during the last perihelionpassage." Thisapparent weather could explain why the researchers found more nitrogen deeperbelow the surface of Eris, which would've been deposited earlier in the season. Theresearch will be detailed in an upcoming issue of the journal Icarus.